Heavy rain today/tonight across PEI..
Tuesday, November 6th 6:45am.. A low pressure system developed along a warm front overnight and is now located near Cape Cod.. This new system will ripple NE along the frontal boundary moving into the Bay of Fundy later this afternoon then across the remainder of the region tonight. A second stronger disturbance, which is the occluded front will move across the Maritimes late tonight into the overnight hours before exiting into Newfoundland by dawn tomorrow. 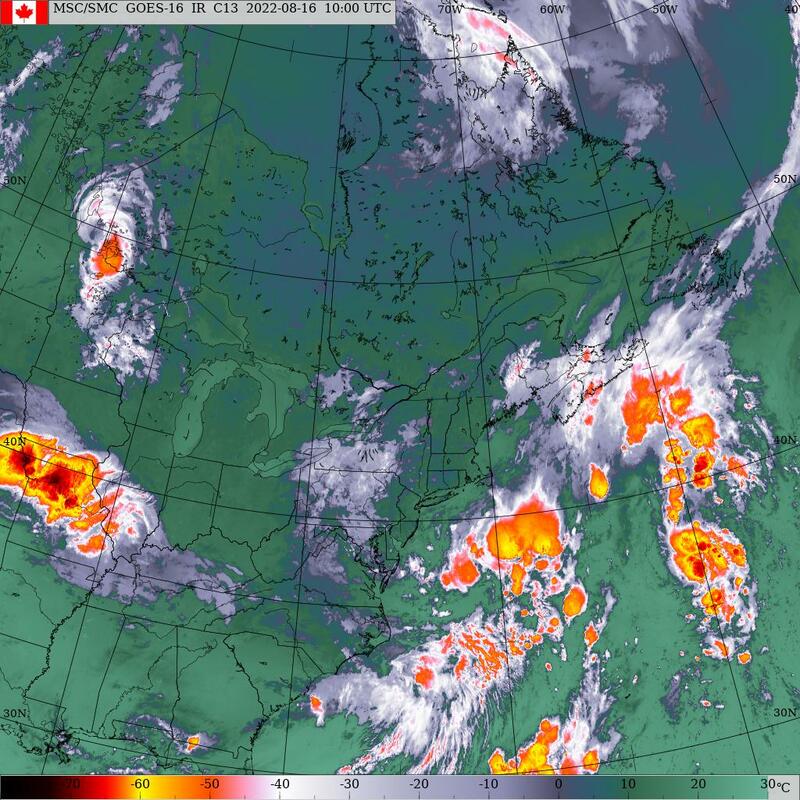 These 2 systems combined will bring a significant amount of rain across the Maritimes which should end by dawn tomorrow. High pressure then begins to build in from the west later tomorrow cresting over the island Friday evening resulting in Sunshine should prevailing later tomorrow through Friday afternoon. Clouds spread across the region later Friday as the next weather system approaches. This system will develop along the eastern Seaboard Friday evening then move NE tracking across western NB Saturday afternoon bringing another rain/wind event for the island. Clearing skies and diminishing winds on Sunday as high pressure begins to build back in. High pressure crests across the island on Monday with Clouds and showers return on Tuesday as another system approaches. Precipitation.. Rain at times heavy today and tonight ending near dawn tomorrow with total mounts in the 30-40 mm range. Dry Wednesday afternoon through Friday evening. Rain develops again Friday night ending Saturday evening. Another 20 mms possible here. Dry Sunday and Monday. Rain Tuesday. Temperatures.. Slow warm-up today as the warm front moves north peaking near 15/16 just after midnight tonight then slowly falling back by dawn tomorrow. Temps still warm but continue to slowly fall through the day. Normal on Thursday. Slightly below normal on Friday then another one-day warm-up for Saturday. The cold arrives on Sunday with temps expected to be well below normal through Monday. Back to normal on Tuesday. Wind.. Brisk SE winds today shifting to SW tonight and continue tomorrow then further shifting to brisk west on Thursday. Winds drop off to calm Friday afternoon as high pressure crests over the island. Increasing easterlies on Saturday as the next system approaches. Remembrance Day Ceremonies Sunday.. Sun and cloud, COLD, could be a flurrie, brisk west winds and late morning temperatures near +1. Dress accordingly for those on parade and crowds watching. Hazards.. Heavy rain event now through near dawn tomorrow with 30-40 mm possible resulting in hazardous driving conditions. Ponding of water on roads, wet leaves can lead to loss of steering/braking. Watches/warnings.. Special weather statement remains in effect today for heavy rain and can be found on the Environment Canada weather website. Today.. Rain at times heavy, brisk SE winds, highs 10 by suppertime. Tonight.. Rain at times heavy ending near dawn, brisk SW winds, temps rising to 15 just after midnight then steady.